Independent curator and researchers in museum study/Sjálfstætt starfandi safnafræðingur-sýningarhönnun. BE.d frá Háskóli Íslands/ upplýsingatækni, miðlun og kennslufræði, MA safnafræði HÍ (BE.d University of Iceland and MA- degree in museum studies). A multimedia exhibition about Icelandic-Canadian soldiers (Icelandic Immigrants in Canada) who served in the Canadian army and Royal Air Force UK in first World War 1914-1918. In World War one 1000 soldiers from the Icelandic-Canadian community in Winnipeg and surrounding did serve in the Canadian army and Royal Air Force UK. The multimedia style which the exhibition is build up form is a technology /form called digital storytelling. Digital storytelling is a short video for 3-5 minute long but newer longer than 5 minutes. In these video/work like that you can use a photo, video clips, voice – over, music, text, animation, drawings, and transition (effect). This work is the combination of several small video setup in 4 videos in all. 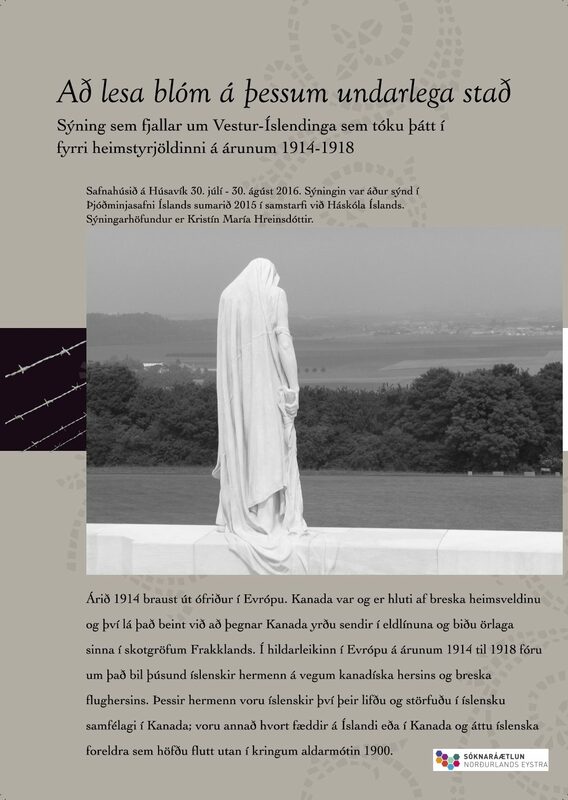 The exhibition was set up in Húsavík Museum July 30 – 30 August 2016 and over summer 2015 in The National Museum of Iceland in collaboration with University of Iceland. Then the exhibition is going to be shown in Akureyri Museum – Sigurhæðir http://www.minjasafnid.is/ in summer 2017 from 1 June to 31. October 2017. The again up at the museum after the New Year 2018.